Monday night, Air America CEO Bennett Zier led a panel with two media bigwigs and polar opposites: Craig Newmark, the laid-back founder of Craigslist, a self-proclaimed nerd who launched CL, "without a plan," in San Francisco, and Michael Wolff, an officer in the sorority of New York media lust, columnist for Vanity Fair, and founder of news aggregate site, Newser.com. The talk was on the future of media and whether one day all of it (namely the news) will be free. Out of all the talk and hyperbole dished by Wolff, on how newspapers will cease to exist in 18-months, one thing stood out: ode to the mighty fact-checker. Craig (I refuse to refer to him by his last name -- he gave us Craigslist!) said he would pay for fact-checkers, so yes, he would continue to pay for his news, as long as it's fact-checked. His answer resonates with this growing fear that, with newspapers slowly disappearing, we might have to, God forbid, rely on the blogosphere for information, and the strict standards of the fact-checking department will be gone. This is obviously a frightening scenario. I have worked at a magazine and have seen the tenacity of fact-checkers first hand. Their paranoia and eye-for-detail drives them to confirm the slightest descriptions in a story -- was it really raining that day? Without them we'd have a lot more Jayson Blair's and Walter Duranty's, reporters who just make stuff up. (By the way, both of these men reported for the New York Times, so even the "paper of record" can let a bad egg get by). It's sad to think that journalistic standards, and reliability, is slipping away as magazines and newspapers shut down. But this is creating a great Hollywood close-up for the humble fact-checker. With all the websites and blogs continuously sprouting up, promising you your news in pill-form, as Wolff's Newser does, there's a marketing opportunity to get one up on the competition: Oh yeah? We have fact-checkers!!! That, my friend, will be the marketing edge in the future of news. Future news: Not only does some great new news site have pithy writers who put the big stories of the day into snark-filled context that represents the political side that you believe in, but it has fact-checkers: two recent college grads from Harvard, who did nothing but read big thick books all through college, checking stories to make sure the facts are in their purest form. It's not only genius marketing but material for the next Devil Wears Prada. So move over, abused editorial assistants! 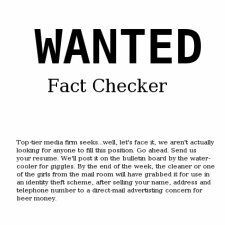 The fact checker will get a moment in the pop culture spotlight as these jobs become a must-have for any site that wants to differentiate itself in the coming all-digital world. We can't all be aggregate sites, there has to be someone still reporting the news, and if that site wants to make money, it has a shot at it. As long as there's a fact-checker on the payroll, people will pay. Craig will, and he should know -- his Craigslist helped destroy newspapers by taking away the revenue of their automotive, real estate, and employment ads by posting them for free on his site. Now as karma, or rather, in the spirit of preserving the best of journalism, he'll continue to pay to get news, as long as its been verified. For more on the doom and gloom in the media discussed in last night's panel, check out this post from PaidContent.org (yes, fitting name). And another interesting observation from last night: Craig said that Craigslist has seen a rise in traffic for the barter category, the free category, people looking to sell their stuff category, and a drop in job postings.